Why should anyone care about the medium of communication today, especially when talking about media law? In today’s digital society, many emphasise convergence and seek new regulatory approaches. In Medium Law, however, the ‘medium theory’ insights of Harold Innis, Marshall McLuhan and the Toronto School of Communication are drawn upon as part of an argument that differences between media, and technological definitions, continue to play a crucial role in the regulation of the media. Indeed, Mac Síthigh argues that the idea of converged, cross-platform, medium-neutral media regulation is unattainable in practice and potentially undesirable in substance. This is demonstrated through the exploration of the regulation of a variety of platforms such as films, games, video-on-demand and premium rate telephone services. Regulatory areas discussed include content regulation, copyright, tax relief for producers and developers, new online services, conflicts between regulatory systems, and freedom of expression. This timely and topical volume will appeal to postgraduate students and postdoctoral researchers interested in fields such as Law, Policy, Regulation, Media Studies, Communications History, and Cultural Studies. The convergence of media law and Internet regulation has caused some to question the need for medium-specific laws: a claim firmly rebutted in this comprehensive review of medium-specific law basing itself on the insight of the ‘Toronto School’ scholars Innis and McLuhan. McSithigh’s excellent monograph provides meticulous case studies in the vagaries of medium law, essential reading for all those interested in the construction of medium-specific regulatory regimes, their evolution and their continued relevance. 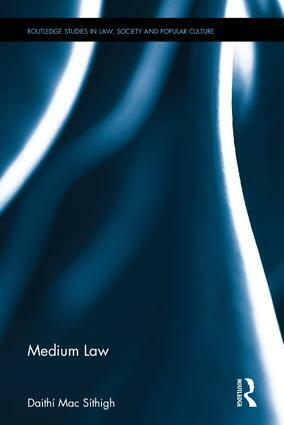 Medium Law provides a rich and detailed overview of the tensions that exist in some of the less-charted areas of UK media law – from the regulation of online radio and video games, to live relay of opera in the cinema, music apps, and video on demand. Mac Sithigh challenges us to reconsider the role of the medium, alongside the message, in framing our media regulation of the future. This timely and highly ambitious book confronts head-on the debate on the development of technology-neutral, future-proof legislation across media platforms. By providing a careful and in-depth analysis of the laws concerning radio, film, TV, games, on-demand services and other entertainment platforms, this insightful book explains why the medium will continue to play a pivotal role in media regulation. Highly recommended. Routledge Studies in Law, Society and Popular Culture is an inter-disciplinary series that examines the relationship between the law and all areas of popular culture. Particular foci include the regulation of spheres of popular culture and representations of law within popular culture. ‘Popular Culture’ is a broad and inclusive church that includes all aspects of leisure and culture, including but not confined to music, sport, film, media, night- time economy, art, literature, the internet etc. Whilst law may well provide a useful vehicle for an analysis of cultural activities within society the absence of law in the field may be just as important and worthy of consideration.